The HIS comprises of physical infrastructure and human resources for data collection, data processing,data storage and data dissemination on hydrological, geo-hydrological and hydro- meteorological quantity and quality variables.HIS is structured as follows to provide the information on water resources / water use system. A network of observational stations. State Surface Water Data Processing Center at Nashik. At Stations: Field data and water quality samples are collected in the surface water observation networks at the stations. The water samples are brought to the water quality laboratories. The field data is submitted to the Sub-divisional / Divisional Data Processing Center at regular intervals (monthly / quarterly). In Water quality laboratories: The analysis of the samples is done and the analysis results are entered in the computer and are subjected to the primary validation. At regular intervals, the laboratory passes the information to the nearest Divisional Data Processing Center. Both measured Daily twice : 8.30 a.m. & 17.30 p.m.
3. Evaporation : Daily twice : 8.30 a.m. & 17.30 p.m.
4. Humidity : Daily twice : 8.30 a.m. & 17.30 p.m.
5. Wind Velocity and direction : Daily twice : 8.30 a.m. & 17.30 p.m.
All the field data entry and primary validation takes place in the sub-divisional data processing center. More advanced, secondary validation is carried out in the Divisional Data Processing Center. After validation the data is transferred to the State Data Processing Center at Nashik. The main activity of the State Data Processing Center is hydrological datavalidation, compilation, analysis and reporting. At the end of hydrological year,the processed data is transferred to the State Data Storage Center at Nashik(MH). Makes the data available to authorized Hydrological Data Users. All available data sets are being maintained in well defined computerized databases using the MS Sql server 2000 database management system. Observed data is first entered in manuscript. (Before Hydrology Project this data was treated as final & the same was used for planning. Now the following procedure is adopted to make the data reliable & quality.). Using SWDES software the data is entered in computer and primary validation is carried out. Primary Validation is carried out at sub divisional level. This data is then sent to division. Secondary validation is carried out using HYMOS software in Division. Secondary validated data is sent to State Data Processing Center, Nashik. Hydrological Validation is carried out using HYMOS software at State Data Processing Center Nashik, after scrutiny of validated data received from division. Interagency validation by sending validated data to central agencies like CWC, IMD is done. This data is then sent to Data Storage Center, Nashik. Geographical and space oriented data on catchments and hydraulic infrastructure. 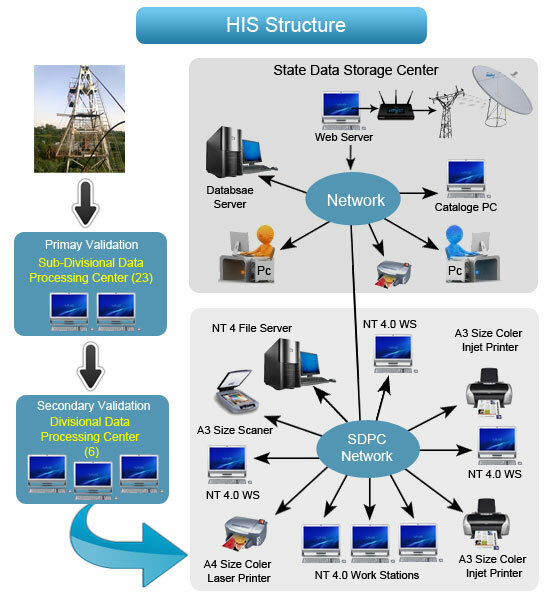 Location oriented data of observation stations and laboratories. Relation oriented (derived) data on two or more variables / parameters used with respect to climatic, water quantity and quality data. Processing results held in objects.